SOULFLY - OMEN SPECIAL EDIT. (CD+DVD DIGI) | Online Shop | Wizard LTD. Album: "OMEN SPECIAL EDIT. 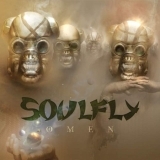 (CD+DVD DIGI)"
SOULFLY will release its seventh album, "Omen", on May 25 via Roadrunner Records. The CD will be made available in a standard edition and a special limited-edition CD/DVD with access to an exclusive MP3 download of the song "Kingdom". A music video for the track "Unleash" will also be featured on the DVD.